Manifestacion frente al Parlamento Nacional en el 2009 - Pobladores de la colonia “Miguel Bonilla”, estudiantes de la UNAN y oficiales del Centro Humboldt se plantaron frente al Parlamento demandando que se declare el cerro Mokorón Parque Nacional. Manuel Zapata para El Nuevo Diario, Nicaragua. City dwellers demonstrate against the urbanization of the Mokorón Hill. One of the last tropical dry forest ecosystem in Central America and the most important aquifer recharge for the water supply in Managua. The Mokorón hill constitutes the “the last lung” in the city of Managua and its importance stems from its biological diversity, which large quantities of birds species, fauna, flora. Mokorón is also is the refuge of the Guardabarranco (Eumomota superciliosa), which is the national bird of Nicaragua. Furthermore, the Hill is known for its archaeological importance and the memory of the Nicaraguan history; until today there are still remains of young people who died during the Nicaragua’s internal conflict. According to the Centro Humboldt, Mokorón Hill is one of the last tropical dry forest ecosystem in Central America and the most important aquifer recharge for the water supply in Managua. In the past, the Hill was used as a military base and with the fall of the Somoza dictatorship in the seventies, the Hill became property of the Sandinist Army and was later donated to the Instituto de Previsión Social Militar (IPSM). Since 2003 the Hill has been distributed among the high command of the IPSM with the aim to urbanize its areas and sell it. The communities around claim that the Hill belongs to the State and all Nicaraguan people. 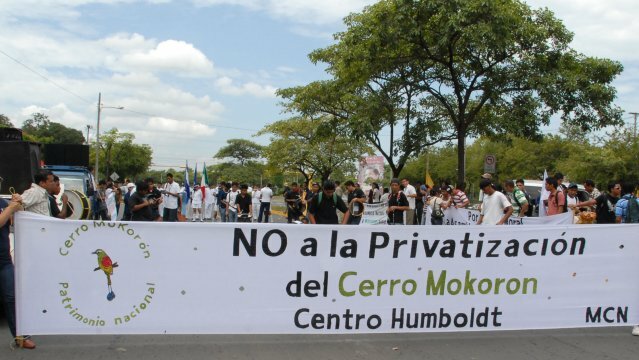 Due to the urban sprawl, deforestation and an urbanistic project called “Monte Cielo Hill” where the IPSM is the principal developer, the Centro Humboldt, the Movimiento Comunal Nicaragüense and the Comité pro Defensa Cerro Mokorón presented a draft law to declare the Mokorón Hill as a National Park. This effort did not succeed and in 2013 the same organisations presented a new draft law to declare the core area (around 30 ha.) as a natural reserve. The whole area, including the buffer zone, constitutes an area of 716,393 ha. and at the moment 35% of the Hill has been destroyed by a building materials mine called “Nido de Aguila”, an urban development project, a football stadium, houses and hotels. In December 2012, the army built a perimeter wall 5 kilometers causing serious damage to the ecosystem, this action restricts access and visibility to the population at Cerro turn impossible to know the actions that are taking place in the forest. On 11 November defenders formed a human chain of 2,000 people demanding that the National Assembly approve the bill to declare Mokoron a national park. Development of Alternatives The presentation of a draft law to declare the Mokoron Hill as a National Park or Natural Reserve. Proposals to develop the zone with a sustainable tourism and other activities related with protected areas such as trails for trekking, camping areas, reforestation projects, tree nurseries, and educational facilities. Why? Explain briefly. The damage to the Mokoron Hill continues, the effort to declare the Hill as a National Park did not succeed but the declaration as a natural reserve is undecided. ALOP (2013). Las organizaciones y movilizaciones sociales por la defensa de los recursos y bienes naturales: Un desafío para la democracia y el Desarrollo en América Latina, IDD capítulo Nicaragua. Madrono, Nicolas. La voz del sandinismo (2013) "Promueven proyecto de ley para declarar al Mokorón reserva natural". Movimiento Comunal Nicaragüense "Lucha permanente por la Defensa y Protección del Cerro Mokorón"
El Nuevo Diario, (julio 2008), "Negocios con Mokorón son todos ilegales"
Trinchera de la Noticia, (2012), ¿Realizarán esta vez algo en defensa del Mokorón? Manifestacion frente al Parlamento Nacional en el 2009 Pobladores de la colonia “Miguel Bonilla”, estudiantes de la UNAN y oficiales del Centro Humboldt se plantaron frente al Parlamento demandando que se declare el cerro Mokorón Parque Nacional. Manuel Zapata para El Nuevo Diario, Nicaragua.